Dolomite is an anhydrous carbonate mineral. It is a double carbonate of calcium and magnesium (CaCO3.MgCO3). It is one of the important raw materials used in production of iron and steel. Dolomite contains theoretically 54.35 % of CaCO3 and 45.65 % of MgCO3 or 30.41 % of CaO, 21.86 % of MgO, and 47.73 % of CO2. However, in nature, dolomite is not available in this exact proportion. Hence generally the rock containing in the range of 40 % to 45 % of MgCO3 is usually called dolomite. The main uses of dolomite in iron and steel industry are (i) as a fluxing material (ii) for protection of refractory lining, and (iii) as a refractory raw material. Dolomite in iron and steel industry is normally used in three forms. These are (i) raw dolomite which is also the natural form of dolomite, (ii) calcined dolomite, and (iii) sintered dolomite. When dolomite is used as a fluxing material then it is used as either raw dolomite or calcined dolomite. When dolomite is used for the protection of refractories, it is used in calcined form and when dolomite is being used as a refractory raw material, it is used in the form of sintered dolomite. The uses and form of dolomite in iron and steel industry is shown in Fig 1. Dolomite after its mining has to undergo several processing before it can be used in various processes. The basic processes in the production of dolomite are (i) quarrying of raw dolomite, (ii) preparing mined dolomite for its use by crushing and sizing, (iii) calcining of raw dolomite, (iv) processing the calcined dolomite further by hydrating to produce hydrated dolomite if required for use, (v) sintering of dolomite for its use as refractory material, and (vi) miscellaneous transfer, storage, and handling operations. All these processes may not be necessary to be present in every plant. Basically three types of dolomite products are used in ironmaking and steelmaking processes. They are (i) raw dolomite products, (ii) calcined dolomite products, and (iii) sintered dolomite products. The processing for dolomite for these products is described below. The first process takes place at dolomite mines where the mined ore undergo crushing and screening for the separation of the different size fractions of the ore. In the iron and steel plant, in some of the places, raw dolomite is further processed. Example is sinter plant where the raw dolomite is crushed in hammer mills to – 3 mm size (generally in the range of 85 % to 90 %). Calcination of dolomite is a thermal treatment process for carrying out the thermal decomposition of the raw dolomite and removal of LOI (loss on ignition) or carbon di-oxide (CO2) part of its composition. Calcination process is an endothermic reaction and is carried out in the solid state. High quality dolomite generally contains around 40 % to 43 % of MgCO3 and around 57 % to 60 % of CaCO3. It requires around 2 tons of raw dolomite to produce one ton of calcined dolomite. Since during calcination, CO2 is removed from the raw dolomite, the calcined dolomite (i) is porous (ii) has higher surface area, (iii) has high reactivity, and (iv) is hygroscopic. When raw dolomite is heated, the carbonates present in the dolomite are decomposed as per the following equation. The calcination of raw dolomite is a simple single stage firing process which is carried out in a shaft kiln or a rotary kiln. The raw dolomite is charged into the kiln and, while progressing through the kiln, is being decomposed or calcined in two steps. In the first step CO2 is start releasing from the MgCO3 component of the dolomite and in the second step CO2 is start releasing from the CaCO3 component of the dolomite. The decomposition temperature is dependent on the partial pressure of the CO2 present in the process atmosphere. Dolomite decomposition takes place in two stages. The first stage starts at around 550 deg C when the decomposition of MgCO3 starts and the second stage takes place at around 810 deg C when the decomposition of CaCO3 starts. The two stages of the calcining process are represented by the following equations. 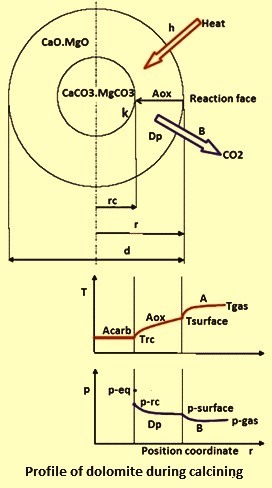 The calcinations process can be explained using a partially decomposed piece of dolomite, whose profiles of CO2 partial pressure and temperature are shown in Fig 2. The sample comprises a dense carbonate core surrounded by a porous layer. In the calcining kiln at a temperature Tgas heat is transferred by radiation and convection (symbolized by ‘h’) to the solid surface at a temperature of Tsurface. By means of thermal conduction (A) heat penetrates through oxide layer to reach the reaction front, where the temperature is Trc. As the reaction enthalpy is many times greater than the internal energy, the heat flowing further into the core is negligible during the reaction. Therefore the core temperature is only slightly lower than the front temperature. Once heat is supplied, the chemical reaction constant (k) then takes place for which the driving force is the deviation of CO2 partial pressure from the equilibrium (p-eq – p-f). The released CO2 diffuses (Dp) through the porous oxide layer to the surface and finally passes by convection (B) to the surroundings where the CO2 partial pressure p-surface exists. The chemical and physical properties of calcined dolomite are influenced by the calcination which in turn is influenced by the conductivity, mass transfer coefficient, and diffusivity of the calcined dolomite layer. For the full calcination of dolomite and to have no residual core of uncalcined dolomite, it is necessary that the heat supplied to the surface of raw dolomite must penetrate via conductive heat transfer to the core. A temperature of 900 deg C is to be reached in the core at least for a short period of time since the atmosphere inside the material is pure CO2. The raw dolomite surface is to be heated to greater than 900 deg C to maintain the required temperature gradient and overcome the insulating effect of the calcined material in the dolomite surface. However, when producing calcined dolomite, the surface temperature must not exceed 1,100 deg C to 1,150 deg C as otherwise re –crystallization of the CaO will occur and result in lower reactivity and thus reduced slaking properties of the calcined product. A certain retention or residence time is required to transfer the heat from the combustion gases to the surface of the raw dolomite and then from the surface to the core of the raw dolomite. Larger pieces of raw dolomite require longer time to calcinate than smaller pieces. In principal, calcining at higher temperatures reduces the retention time needed. However, too high temperatures adversely affect the reactivity of the product. The relation between calcining temperature and retention time needed for different sizes of raw dolomite is shown in Tab 1. Several different types of kilns are used for the calcination process. These kilns can be rotary kilns or shaft kilns. The type of the kiln to be selected strongly depend on the characteristics of the raw dolomite, anticipated production rate, cost of fuel, investment costs, available fuel, local conditions, infrastructure and other things. In general, all data including laboratory tests are to be evaluated prior to selecting the calcining kiln. Rotary kilns, with or without preheaters, usually process raw dolomite with material size between 10 mm and 50 mm. The heat balance of this type of kilns is categorized by somewhat high losses with the off-gases and through the kiln shell. Typical values for the off-gas losses are in the range of around 25 % and for kiln shell losses are in the range of around 20 % of the total heat requirement. Only around 60 % of the fuel energy introduced into the kiln with preheater is used for the process of calcining. In case of single vertical shaft kilns, there exists an imbalance between the heat available from the calcining zone and heat required in the preheating zone. Even with the ideal calcination process the temperature of the waste gases may be higher than 100 deg C. In case of parallel flow regenerative (PFR) type of kilns, there is better utilization of the heat of the calcining zone and minimization of the loss of heat in the waste gases, resulting into lower heat consumption per ton of calcined dolomite. Comparison of data concerning kilns typically used for dolomite calcination with important consumption figures and typical raw material size is given in Tab 2. The third type of processing of dolomite consists of sintering of the dolomite. The process is also sometimes called roasting of raw dolomite. Sintered dolomite is used for making refractory products. Sinter dolomite is also known as dead burned dolomite which is made by heating the raw dolomite at a temperature which is higher than 1650 deg C and preferably exceeding 1800 deg C. Sintering of raw dolomite is carried out with an aim to achieve a maximum bulk specific density and high resistance to hydration. The most common process for the production of sintered dolomite is a single stage firing process in a shaft kiln or a rotary kiln. The raw dolomite is charged into the kiln and, while progressing through the kiln, it gets decomposed in two steps. In the first step CO2 is released from the MgCO3 component of the dolomite starting at around 550 deg C and in the second step CaCO3 component is decomposed at temperatures around 810 deg C. After complete calcination, the calcined dolomite is further heated to the sintering temperature. At this temperature, the porosity of the already calcined material reduces resulting in an increased bulk specific density of the product which is vital for refractory applications. The typical consumption figures as well as some basic kiln feed raw dolomite size is given in Tab 3. The performance of the sintering process is strongly dependent on the sinterability of the raw dolomite, which in turn is affected by characteristics of the specific textural characteristic such as chemical composition, purity, homogeneity, origin, genesis, porosity and crystal structure. In addition, the fuel (such as the ash of solid fuel) for the burning process can have a significant influence on the final product quality. In the case of raw dolomite of high purity, a satisfying product quality frequently can only be achieved in combination with solid fuels with the fuel impurities acting as ‘sintering aids’. The raw dolomite characteristics can affect the product quality negatively resulting in a low and inhomogeneous bulk specific density or in a poor resistance to hydration. One of these parameters may restrict the application in the refractory industry, especially if top quality refractory bricks are to be produced. It is almost impossible to correct these effects with modified kiln operation. The vertical shaft kiln used for the sintering of dolomite uses calcined dolomite briquettes as the feed material. It works on a counter-current flow technology and consists of a cylindrical steel shell with a height of round 10 m and lined with basic refractories. The calcined dolomite briquettes enter the kiln through a feeding hopper positioned at the top of the kiln. While passing the preheating zone in the upper kiln section, the dolomite briquettes are heated from ambient temperature close to sintering temperature due to the intensive contact with hot upstream kiln gases. The single shaft kiln can be designed to achieve kiln temperatures well in excess of 2000 deg C at the lowest specific heat consumption for sintering of dolomite for the production of the basic refractories. This is achieved (i) by using the counter current flow principle, (ii) a specific radial multi-burner system, (iii) a continuously operating discharge table, and (iv) an integrated product cooling system in the discharge zone of the kiln. The high temperature vertical shaft kiln can fully satisfy the quality criteria while meeting the tough requirements with respect to low production costs. Also the kiln concept enables a stable operation even at reduced capacity. The kiln is usually of compact design which provides the desired reliable performance and ensures continuous and smooth kiln operation. The rather short retention time of the product in combination with the optimum exposure to the kiln atmosphere explains the small kiln dimensions compared with the high specific production rates. Various operating parameters and a defined temperature profile can easily be adjusted which provides high flexibility in kiln operation. These characteristics are combined with low specific heat consumption as well as low operating and investment costs. During the production of iron by blast furnace (BF) route, dolomite is added either in the process of sintering or as a direct feed in the blast furnace. Raw dolomite is normally used for this addition. Dolomite addition is made during ironmaking for obtaining desired percentage of MgO in the BF slag. Addition of dolomite through sinter is more preferred route since CO2 of dolomite is driven out during the sintering process. In case of sintering, dolomite is crushed to -3 mm (in the range of 85 % to 90 %) in hammer crushers before mixing it in the sinter mix. In case of direct feed to blast furnace, lump dolomite (10 mm to 30 mm size) is used. 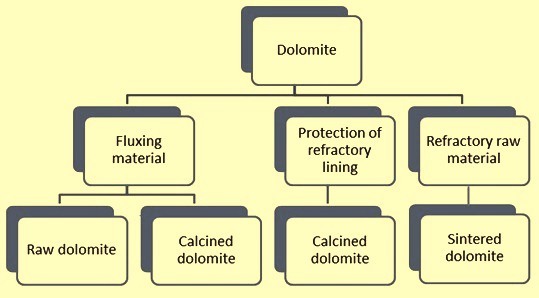 In case of dolomite addition through sintering, these days calcined dolomite is alsodirectly being used. Use of calcined dolomite in the sintering process has the advantages of (i) Improvement in the binding characteristics of sinter mix, (ii) improvement in the productivity of sintering machine, (iii) improvement in the sinter strength, and (iv) reduction in the volume of exhaust gases with associated advantages. High silica (SiO2) content in the dolomite used for sintering purpose is preferred since SiO2 counter the effect of alumina (Al2O3) in the blast furnace. In the production of direct reduced iron (DRI) by the rotary kiln process, dolomite is used as a desulphurizing agent. Raw dolomite is used in the size range of 4 mm to 8 mm. The second major use of dolomite is in steelmaking. In steelmaking dolomite is used both as a fluxing material and also as a refractory material. For use in steelmaking, the SiO2 (because of its acidic nature) content in the dolomite is to be very low preferably less than 1 %. When it is used as a fluxing material, it is used in calcined form. As a fluxing material, it has a dual role. In its first role it is a source of some lime (CaO) and thus reduces the consumption of calcined lime. But the second role of calcined dolomite is the more important role. In this role it is used to protect the magnesia-carbon lining of the steelmaking vessel. This is done by making a steelmaking slag which is super saturated in MgO at the temperature of steelmaking. These days slag splashing technology is being used extensively for the enhancement of the lining life of the BOF (basic oxygen furnace) vessel. In this technology, calcined dolomite is added to the retained liquid slag which is to be splashed on the BOF vessel. This is done to enhance the viscosity of the slag so that it can have better sticking properties and also to enhance the refractoriness of the slag. Calcined dolomite is also increasingly being used as a part of synthetic slags usually added during ladle metallurgy. This is done to protect the ladle lining especially at the slag line. When dolomite is used as refractory material, then it is used in form of sintered dolomite. Sintered dolomite is used in steel making for the production of tar dolomite bricks, pitch impregnated dolomite bricks or resin bonded dolomite bricks for the lining of BOF vessel, AOD (argon oxygen decarburization) vessel, and to a lesser extent electric arc furnace. These bricks are also used for the lining of the steel ladles. Dolomite based monolithic refractories such as gunniting mixes are also used for the maintenance of the refractories of the steelmaking furnaces. Gunniting is normally done in those areas of refractory lining where there is high wear. These refractories are also used to form the hearth and banks in EAF, and to maintain them on a regular basis. The maintenance of these areas is often carried out using a high iron, sintered dolomite which is applied on a frequent basis between heats using a spinning machine. The machine is lowered into the furnace and applies several tons of fettling material in a couple of minutes between the heats. This fast, low cost solution is used particularly in those parts of the furnace where there is fast wear of refractories.